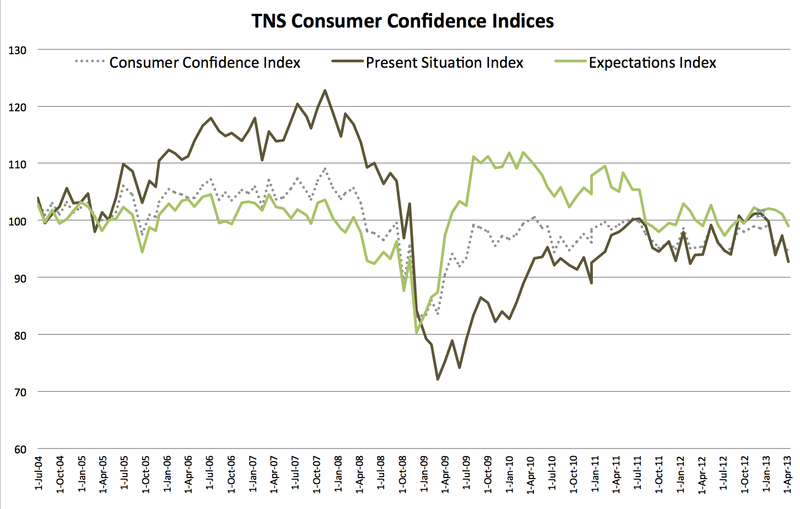 The Fragile Nature of Consumer Confidence | Jenkins Research Inc. The impression one gets from a casual following of economic news is that Canada is doing well but not outstanding. There are concerns about Europe and the U.S. but these seem divorced from the day-to-day lives of most Canadians. Nevertheless, consumer confidence has dropped quite precipitously over the past three months. According to TNS Canada, public perceptions have dropped from an index score of 101.2 in December to 92.7 in April: the lowest level since 2011. While I have previously suggested that the current period could be labeled a period of stagnation, it is interesting that confidence has begun to falter over a four month period. Canadians have not changed their outlook for the future (it is not euphoria, but clearly leans positive) much over the same period and their recent pessimism about their current situation does not appear to be well-grounded. In real terms, the financial status of most Canadians is a reflection of their income and their expenses. Over the past three months, the unemployment rate has remained fairly stable (after recording 7.0% in January and February it did rise to 7.2% in March) and there is little evidence of inflation at least overall. While there are winners and losers in the current economy, it is hard to see what is driving a rise in the number of losers, especially as the long-term outlook remains stable. It may be that the tone of news coverage about the economy in Canada and abroad has focused Canadians on the short-term risks to the economy. We see this in a falling personal situation index and an unchanged expectations index. Canadians have not lost too much hope (the expectations index has fallen marginally) for the future but they have also not gained any. As Canadians move into summer, we may see some of the recent pessimism about their finances disappear. This would be consistent with paying less attention to negative news and more attention to enjoying the weather and all that comes with it. The trend over the next couple of months will be interesting because a faltering personal outlook will no doubt have economic consequences in terms of consumer spending. Alternatively, rather than seeing the current situation as a reflection of perceptions of the economic fundamentals, the current malaise may be about more and more Canadians seeing themselves losing ground. Rising household debt, government spending cutbacks and growing economic inequality could all be contributing to a sense among Canadians that they themselves are not doing as well as they did in the past (or as others are doing). Which is more likely the explanation? (1) real changes in the personal situation of Canadian, that might include growing inequality and personal debt (2) short-term reaction to economic news.